Yesterday financial regulators proposed a revised rule addressing the retention of credit risk for sponsors of securitizations -- the proposed rule can be found here (PDF).1 The thought is that by removing the separation between the origination and securitization of loans, lenders will focus more on the quality of loans rather than the quantity, as they would have to keep some 'skin in the game' when structuring asset-backed securities. The original March 2011 proposal (PDF) required securitizers to retain at least 5% of the credit risk for any risky assets that do not satisfy the requirements of a "qualified residential mortgage" (QRM). One of the main differences between the original proposal and the new proposal is the QRM definition. In the original proposed rule, a QRM is "closed-end credit transaction to purchase or refinance a one-to-four family property at least one unit of which is the principal dwelling of a borrower". The mortgage must have a term of at most 30 years and must be secured by a first-lien. In addition, the borrower must satisfy certain credit requirements including a relatively clean credit report (e.g. no currently past due obligations, etc. ), income requirements (debt-to-income ratio not to exceed 28%) and the borrower must put down a 20% down payment (loan-to-value ratio of at most 80%). Both banks and consumer advocates criticized the original proposal since the overly restrictive requirements on the mortgages would "drastically limit affordable mortgage financing options". In addition, policymakers criticized the rule fearing that limiting financing options would likely stifle the recovery in the housing market. The collected comments on the original proposal can be found here. The proposal's latest incarnation broadens the definition of a QRM and makes the definition consistent with the Consumer Financial Protection Bureau's (CFPB) Qualified Mortgage (QM) Standard (PDF).2 According to the President of the American Banker's Association, the broader definition of a QRM will let lenders issue relatively high-quality mortgages and possibly make loans cheaper since they could sell them in the secondary market. Of course, by broadening the definition of a QRM, the proposed rule also weakens investor protections by allowing lenders to originate lower quality mortgages and then effectively remove any credit risk from their books through securitization. As SEC Commissioner Gallagher put it, "What is the point of promulgating a risk retention standard and then exempting everything from it?" 1 The proposed rule was required by Section 941 of the Dodd-Frank Wall Street Reform and Consumer Protection Act (PDF). 2 For more information, see the SEC white paper (PDF) "Qualified Residential Mortgage: Background Data Analysis on Credit Risk Retention." Nearly a year after the "flash crash" of May 6, 2010, the Securities and Exchange Commission (SEC) proposed a "limit up-limit down" mechanism that would limit the trading prices for listed equity securities to within a range near recent prices -- effectively limiting the realizable volatility of the price movements.1 The proposal called for price bands around the average price over the preceding five-minute period and would prevent execution of trades outside of these bands. The proposal was designed to circumvent trading errors and to damper market volatility. ETF sponsors quickly backed the new SEC proposal since exchange-traded funds (ETFs) "have continued to be stung by flash crashes in single ETFs." An associate director of global ETF research at Morningstar said that the "proposal would provide a better experience for investors by avoiding broken trades and other inefficiencies." A year later, the SEC approved the "limit up-limit down" mechanism with a few alterations to the original plan. The price bands were defined as "5%, 10%, 20%, or the lesser of $.15 or 75%, depending on the price of the stock." The first phase of the implementation essentially covered the securities in the circuit breaker program while the second phase would apply more widely. It turns that out that one major problem with the program is the definition of the word "price". For securities that don't trade frequently, there may not even be a trade in the last five minutes. If there are no trades, you'd have to look at orders. As explained by Ugo Egbunike at IndexUniverse, whether an ETF's trading is halted under the new rules depends on the 'national best bid' (NBB) for that fund, not the price of executed trades. The NBB was designed to give traders a sense for prevailing market prices; however, some have argued that high frequency traders can manipulate the NBB, reducing its usefulness for practical or regulatory purposes. In fact, there is some evidence that when 50 ETFs were halted on August 19, 2013, it was due to high frequency trading algorithms manipulating the NBB -- not as a result of trades being executed at large price deviations. While it is not clear why there were so many halts (or indeed how many is too many), there are some features of the program that could be susceptible to some forms of high frequency trading. The New York Stock Exchange (NYSE) lifted the limit rules yesterday on over 500 ETFs because of their relatively infrequent trading (an average of 10,000 times per day or less). For these ETFs, the quotes on which the limit-up/limit-down system is based "can zip around based on available liquidity." It will be interesting to see whether the SEC or the NYSE change the proposed rule to look at actual trades rather than NBB quotes (more akin to the previous system). While actual trades in relatively illiquid ETFs may be infrequent, it may be less susceptible to manipulation from high frequency traders. 1 This proposal expands upon the 18 month trial single-stock circuit breaker program introduced by the SEC in June 2010 immediately following the flash crash. This program applied to S&P 500 stocks, Russell 1000 stocks and to a list of exchange-traded products that track stock indexes. Many pension funds have struggled to achieve sufficient return on their investments in the current low interest rate environment. Some have begun investing in insurance-linked securities, particularly catastrophe ('cat') bonds. You can find our primer on insurance-linked securities here; essentially, insurance companies issue cat bonds to transfer the risk of catastrophic losses to investors, meaning cat bond investors suffer losses in the event of a major disaster. While such risk might be considered unsuitable for a pension fund, recently issued cat bonds also have another potentially risky feature that could lead to widespread losses under certain circumstances. These cat bonds are called 'cat bond-lite' structures. Traditional cat bonds are created through a special purpose vehicle (SPV), a separate legal entity often domiciled in the Cayman Islands or other legally favorable offshore location. SPVs are also used by CDOs and other complex structured securities as a way of separating the assets linked to the security from the rest of the issuer's assets. That way, if the deal goes awry, only the assets in the SPV are at risk, limiting insolvency risk to some extent. However, setting up an SPV might be relatively expensive. There might be some marginal cost increases [for using an SPV over an SAC] but they really are on the edges. Whenever I've looked at it I've concluded [an SAC] was introducing vulnerabilities for something that doesn't really have that many advantages. What this means for pension funds is that cat bond-lite transactions expose pension funds to not only the risk of loss stemming from particular major disasters, but also to insolvency risk of cat bond-lite SACs. While many of the legal ramifications of cat bond-lite structures remain untested, the controversy does shed some new light on the growing market for cat bonds and insurance-linked securities. 1 The first cat bond-lite transaction occurred in the summer of 2010. Yesterday, FINRA fined Morgan Stanley for best execution and for charging excessive markups or markdowns. We have been covering markups extensively, and we have taken the Morgan Stanley municipal bond transactions identified by the FINRA action and applied our markup calculation methodology to calculate the distribution of markups charged by Morgan Stanley. Let's start with an example. FINRA flagged a customer purchase of $145,000 in a West Virginia municipal bond (CUSIP: 95639RBW8) on September 19, 2008 at 11:01 AM. Morgan Stanley sold this bond to the customer at a price of $99.64. Looking at the EMMA trade data for this bond, we can identify this transaction exactly. We can also see that at 8:27 AM that same day, there was a much larger inter-dealer trade for only $88.70! That's a markup of over 12% or more than 8 times the median markup of similar sized bond trades. The average interdealer price on September 19, 2008 was $88.60 and the average interdealer price on September 18 and 19, 2008 was $88.06. There were 5 other, smaller, customer purchases of this bond on September 18 and September 19 with a weighted average price of $92.25. Morgan Stanley charged this customer $7.41 more per bond than other customers making smaller purchases in the same bond at the same time were being charged. This matches a very similar pattern to other municipal bond markups we have identified before. We compared the distribution of estimated markups from a sample of over 13.5 million customer trades in fixed-coupon, long-term municipal bonds to those mentioned in the Morgan Stanley AWC. The following figure shows the 50th percentile markup, 71st percentile markup and 95th percentile markup for the distribution of fixed-rate, long-term customer trades from our large sample. Also included in this figure are the individual Morgan Stanley customer purchases mentioned by FINRA that had a corresponding match in the EMMA data. The majority of the AWC purchases are for less than 100,000. Many of the markups charged by Morgan Stanley and identified by FINRA were less than 5% of the bond's market price. The so-called '5% Policy' -- that markups charged above 5% of prevailing market prices constitute excessive -- has been challenged by many, and in 2011 FINRA proposed scrapping the term altogether (PDF). Yesterday's action against Morgan Stanley suggests that even markups under 5% can be excessive and subject to restitution. 47 of the 165 municipal bond transactions could not be found in EMMA trade data. This is an issue we have discussed before in the context of municipal bond ETFs, whose transactions also do not always appear to be reflected in EMMA, or sometimes appear in the wrong direction (purchases as sales and vice versa). It may be that the data reported to EMMA is either incomplete, inconsistent (with some reported prices including markups while others do not), or contains erroneous entries. Our colleagues' research suggests that excessive markets are endemic to the municipal bond market, and that retail investors have been charged over $10 billion in markups by brokers over just the last eight years. This FINRA action may only be the first of many actions against brokers for this potentially very common issue. Earlier this month, the SEC's claims against Ebrahim Shabudin (the former Chief Operating Officer of UCBH Holdings, Inc.) were settled. The SEC "alleges Mr. Shabudin and other defendants concealed losses on loans and other assets from the bank’s auditors and delayed the proper reporting of those losses." To settle the charges, Shabudin has agreed to pay a civil penalty of $175,000, "with the penalty partially reduced by the amount paid as a civil penalty in a related administrative action brought against him by the Federal Deposit Insurance Corporation." Shabudin also consented to a final judgment that enjoins him from future violations of the securities laws and bars him from acting as an officer or director of a public company. On August 16, final judgments were entered against Giuseppe Pino Baldassarre and Robert Mouallem for their alleged involvement in "a fraudulent broker bribery scheme designed to manipulate the market for the common stock of Dolphin Digital Media, Inc." The final judgments permanently enjoin the defendants from future violations of the securities laws, order them to "pay total combined disgorgement and prejudgment interest of $21,932.03, which is deemed satisfied by the forfeiture orders entered against them in a parallel criminal action," and bar them from participating in the offering of penny stock. Additionally, an officer and director bar has been put in place against Baldassarre. Earlier this week, an order of permanent injunction was entered against Blake Richards, which enjoins him "from further violations of the securities laws in connection with allegations that the registered representative misappropriated investor funds." According to the SEC, Richards "misappropriated approximately $2 million from at least seven investors." The order determined that "the issues of disgorgement and civil penalties will be resolved on motion of the Commission at a later date." According to the complaint (PDF), Robert Narvett and his company, Shield Management Group, Inc., defrauded investors of at least $940,000. Narvett allegedly raised the "funds though the fraudulent offer and sale of promissory notes issued by Shield" and then misappropriated these funds for his personal use. The complaint charges the defendants with violating the Securities Act and Exchange Act, and seeks permanent injunction, disgorgement, prejudgment interest, and civil penalties. Morgan Stanley has been fined by the Financial Industry Regulatory Authority (FINRA) for "failing to provide best execution in certain customer transactions involving corporate and agency bonds, and failing to provide a fair and reasonable price in certain customer transactions involving municipal bonds" according to today's news release. The story has also been picked up by the Bond Buyer and Law360, and you can find the complete acceptance, waiver and consent (PDF). This action reflects the increased attention being paid to markups on bond trades. We spent an entire week covering municipal bond markups here on the SLCG Blog, highlighting our colleagues' recent research paper showing billions of dollars in excessive markups charged on US municipal bond transactions. Today's action might be just the beginning in a larger crackdown on these excessive charges. This action related to 165 municipal bond transactions, as well as 116 corporate and agency bond transactions. We have analyzed those municipal bond transactions and compared their markups to those in the wider municipal bond market -- you can find those results in our followup post. Inland American Real Estate Trust, the largest non-traded real estate investment trust (REIT), has been the subject of intense scrutiny. In many ways, the criticism of Inland American has been representative of the issues endemic to non-traded REITs generally, such as poor dividend coverage, conflicts of interest, excessive payments to affiliates, stale or poorly updated share prices, and other issues we have discussed on this blog and in our research work (PDF). While these issues have been known for some time, there is still a lot happening in the non-traded REIT space, and with Inland American in particular. According to the Direct Investments Spectrum, Inland American is still by far the largest non-traded REIT by total assets, with approximately $10.7 billion as of March 31, 2013. The next largest, Cole Credit Property Trust II, had only $7.3 billion, and Columbia Property Trust (formerly known as Wells REIT II) came in third with $5.6 billion. Like most non-traded REITs, Inland American was originally sold at a fixed share price of $10 per share, even after the real estate collapse of 2007-8. Once FINRA began requiring updated per share net asset values, Inland American reported a value of $8.03, and which has most recently been reported at $6.93. However, this is not necessarily the price investors could obtain for selling their shares, as non-traded REITs are largely illiquid, and share repurchase programs often have restrictions and limits. The most recent tender offer on Inland American shares is for $5.00 per share. Inland American has been the subject of an SEC investigation since at least May 2012. While the details of that investigation remain unclear, it has been suggested that the SEC is focusing on the disclosure of property valuations and management fees. As we noted previously, Inland American uses a network of affiliated entities to provide services to the non-traded REIT, many of which collect significant fees on new funds raised, real estate operations, or distributions to investors. Indeed, in March 2013 Inland American was sued by investors over payments to an affiliate, Inland American Business Manager & Advisor Inc.1 The affiliate collected a 5% fee on distributions to investors, and was able to collect $185 million in fees between 2005 and 2012. The suit alleges that those fees were inflated because the 'distributions' to investors were actually return of capital -- a common criticism of non-traded REITs. Even as of the first quarter of 2013, Inland American was paying higher distributions than its modified funds from operations, according to the Direct Investments Spectrum. We will be watching these investigations closely. As many of these criticisms also apply to other non-traded REITs, these investigations may have important implications for the entire $87 billion non-traded REIT industry. 1 The case is William Trumbo et al. v. The Inland Group Inc., filed in the Circuit Court of Cook County, Illinois. You can find the complaint here (PDF). On Monday, Philip Falcone and Harbinger Capital Partners, LLC, the hedge fund he founded in 2001, agreed to a settlement with the Securities and Exchange Commission (SEC) that in addition to an $18 million penalty included an admission of wrongdoing.1 This is the first high-profile settlement with an admission of guilt since SEC Chairman Mary Jo White said the commission would seek more admissions of guilt rather than continue its longstanding policy of allowing defendants to 'neither admit nor deny' claims of fraud. The SEC's Enforcement Division had previously reached a settlement with Falcone and Harbinger, but that agreement was rejected by SEC commissioners who reportedly deemed the deal too weak. Monday's settlement is essentially the same dollar amount but increases the ban to five years for Mr. Falcone. The additional admission of wrongdoing could represent a major step in the Commission's enforcement policy and could grease the wheels of potential civil and criminal cases against the embattled fund manager. Falcone's case could have implications for the SEC's other investigations, including the infamous "London Whale" case against JP Morgan regarding derivatives losses. Indeed, if the SEC is able to obtain admissions of wrongdoing in other cases, more criminal charges could be brought for securities fraud, effectively stepping up enforcement and penalties. But there is another important implication as well. The SEC's former 'neither admit nor deny' policy made it difficult for the public to definitively know whether a particular fraud occurred, or if the defendant merely accepted settlement to avoid prosecution. This meant that investors could not ascertain the risk of such fraud in the future. In fact, in 2011 a New York federal judge dismissed a $285 million SEC settlement with Citigroup on the grounds that its 'neither admit nor deny' clause prevented the court from determining guilt. Monday's settlement brings to a close a long battle between the SEC and Mr. Falcone. But it also could signal a new era at the SEC, one in which enforcement of securities laws does not end with a settlement agreement. 1 The settlement stems from charges filed by the SEC in the June 2012 complaint (PDF). The Global Association of Risk Professionals (GARP) is reporting that banks are watering down terms of new loans under competitive pressure. For example, some banks are increasing the length of amortization from the usual 15 years to the 25 years, others are decreasing required debt-service coverage from 1.25 to as low as 1 times cash flow while still others are waiving cancellation/prepayment fees. The relaxation of loan standards is not unique to the commercial loan industry. Recently, terms of residential mortgages and home loans have seen similar relaxation as home prices have been steadily increasing. The Mortgage Credit Availability Index (MCAI) also indicates that loan terms have been weakening for the better part of eighteen months. Of course by offering loans with more lax terms, lenders are exposing themselves to default risks and possibly helping to inflate another bubble. However, lending standards are still rather tight compared to the heyday of the housing boom. The MCAI, which is currently at a level of 112, would have been approximately 800 in 2007. Nonetheless, it is interesting that lenders are competing on loan structure rather than on price. It may be that banks fear the regulatory implications of over-leveraging, and thus are modifying loan terms as a way of gaining a competitive advantage without appearing overstretched. Whether these modified loan terms will have repercussions in the senior loan or mortgage-backed securities markets remain to be seen. According to the complaint (PDF), Conrad M. Black, former Chief Executive Officer of Hollinger International, Inc., "fraudulently diverted money from Hollinger International to himself and other corporate insiders in the form of purported non-competition payments in the PMG Acquisition and Forum Communications Company newspaper sale transactions." Additionally, Black allegedly "made misstatements and omissions of material fact about these related party payments in Hollinger International's filings with the Commission." A final judgment was entered against Black that permanently enjoins him from future violations of the Exchange Act, orders him to pay over $4 million in disgorgement and prejudgment interest to Chicago Newspaper Liquidation Corporation, and prohibits Black from "acting as an officer or director of any public company." Last week the SEC charged Thomas Gaffney, Health Sciences Group, Inc., Mark Balbirer, Stephen F. Molinari, Nationwide Pharmassist Corp., Jack Freedman, Jeffrey L. Schultz, Redfin Network, Inc., Richard P. Greene, Peter Santamaria, Douglas P. Martin, VHGI Holdings, Inc., and Sheldon R. Simon with engaging in various schemes involving "undisclosed inducement payments made to individuals to facilitate the manipulation of the stock of several microcap issuers." According to the SEC, "the defendants in the schemes involving undisclosed kickbacks understood they needed to disguise the kickbacks as payments to phony companies, which they knew would perform no actual work" and in the schemes "involving the undisclosed inducement payments or bribe...the defendants knew their illegal activities were meant to artificially inflate the companies’ stock volume and prices." The SEC has charged the defendants with violating sections of the Exchange Act and Securities Act and seeks "permanent injunctions, disgorgement plus prejudgment interest, and financial penalties against all the defendants; penny stock bars against all the individual defendants; and officer-and-director bars against defendants Schultz, Martin, Gaffney, and Molinari." According to the complaint (PDF), Javier Martin-Artajo and Julien Grout, two former traders at JPMorgan Chase & Co., "fraudulently overvalu[ed] investments in order to hide massive losses in a portfolio they managed." According to the SEC, the defendants "deliberately mismark[ed] hundreds of positions by maximizing their value instead of marking them at the mid-market prices that would reveal the losses." This caused "JPMorgan's reported first quarter income before income tax expense to be overstated by $660 million." The SEC has charged Martin-Artajo and Grout with violating sections of the Exchange Act. The SEC's investigation remains ongoing. According to the complaint (PDF), Anchor Bancorp Wisconsin, Inc. and its former CFO, Dale C. Ringgenberg, "intentionally or recklessly made material misstatements in Anchor's quarterly Report on Form 10 Q for the period ended June 30, 2009." The defendants consented to final judgments that permanently enjoin them from future vioaltions of the Exchange Act and order Ringgenberg to pay a $75,000 civil penalty, and impose a 5-year officer and director bar against Ringgenberg. According to the complaint (PDF), Anthony J. Davian through his asset management firm, Davian Capital Advisors, LLC, "raised more than $1.5 million from investors by promoting Davian Capital Advisors, LLC as a highly successful investment management firm" and then "misappropriated at least $1 million in investor proceeds [using] the funds to pay for personal expenses such as the purchase of a luxury home and automobile." Davian has been charged with violating various sections of the securities laws. The SEC received a temporary restraining order and asset freeze against Davian and seeks permanent injunctions, disgorgement of ill-gotten gains, and financial penalties. Gregory N. McKnight was sentenced to 188 months in prison followed by 3 years of supervised release and ordered to pay over $48.9 million in restitution for his "role in orchestrating a $72 million Ponzi scheme" through his company Legisi Holdings. These charges arose from the same facts that "were the subject of an emergency action that the Commission filed against McKnight and others on May 5, 2008." In July 2011, a final judgment was entered against McKnight based on the Commission's action that ordered him to "pay disgorgement of ill-gotten gains, prejudgment interest, and civil penalties totaling approximately $6.5 million" and permanently enjoined him from violating sections of the Securities Act and Exchange Act. Earlier last month, "McKnight's associate Matthew J. Gagnon was sentenced to five years in prison for his role in promoting Legisi." According to the complaint (PDF), Joseph M. Tocci, former executive of American Superconductor Corporation, used insider information he "obtained as the assistant treasurer of American Superconductor to purchase option contracts through which [he] essentially bet that the company's stock price would soon decrease on the release of negative news." Tocci gained over $80,000 in illicit profits based on this trading. Tocci has consented to a judgment that enjoins him from future violations of the Exchange Act and orders him to pay over $170,000 in disgorgement, prejudgment interest, and civil penalties. Additionally, Tocci has agreed to plead guilty in a parallel criminal case. Do Leveraged ETFs Increase Stock Market Volatility? Leveraged exchange-traded funds (LETFs) are controversial investments. Because they can be leveraged as much as 3x, and can be linked to highly volatile underlying assets, their daily price movement is typically very dramatic. Also, LETFs tend to lose value over time if their underlying assets are relatively volatile due to rebalancing effects, something we've covered here before as well as in our research papers (PDFs). Another concern with LETFs is that they could increase the volatility of their underlying assets. To see how, consider how a typical LETF achieves its leverage. If its assets increase in value over the course of a day, the LETF has to purchase more of those assets in order to keep its leverage ratio (2x, 3x, etc.) constant. If those assets decrease in value, the LETF has to sell some assets for the same reason. The concern is that if LETFs attract significant assets, these rebalancing transactions could create a positive feedback loop of increased buying in rising markets and increased selling in downward-trending markets. Recent research from the Federal Reserve (PDF) suggests that just this situation could occur and could have a large effect in the stock market. In fact, the paper argues that LETFs "contributed to the stock market volatility in the 2008-2009 financial crisis and in the second half of 2011 when the European sovereign debt crisis came to the forefront." The paper also notes that because LETFs must rebalance every day, that their trading activity "is predictable and may attract anticipatory trading." This could also exacerbate the positive feedback loop, leading rising stocks higher and falling stocks lower, as we have discussed before. Interestingly, the paper compares LETFs to 'portfolio insurance strategies' of the late 1980s. Portfolio insurance is a hedging technique that also effectively requires purchasing assets in rising markets and selling in falling markets. It is thought to have contributed to the stock market crash of Black Monday (October 19, 1987), when the Dow Jones lost almost a quarter of its value in a single day. While equity LETFs currently may not be a particularly large fraction of stock market trading, as LETFs expand to other, less liquid asset classes, these rebalancing effects could become more pronounced. Also, not everyone agrees about the effects of LETF rebalancing. Unfortunately, we may have to wait for a particularly grim day on Wall Street to truly test this effect. In the past few months, we have constructed a database of thousands of structured certificates of deposit (CDs). We have analyzed and evaluated hundreds of these CDs and have compiled these results into a recently completed study (PDF). Our results indicate that structured CDs are usually issued at significant discounts to face-value (comparable to structured products), offer little if any market exposure and are often less valuable than contemporaneously issued fixed rate CDs. We've recently come across a structured CD that has some interesting features and we thought we'd take this opportunity to talk about them in some detail. This particular structured CD pays interest annually at a minimum rate of 1% per annum for five years. It adds additional contingent interest based on the prices of three common stocks, known as the 'basket'. The price of each stock in the basket is observed annually. For a given observation date, if all of the stock prices are at least as high as their respective initial prices when the CD was offered, then the CD pays an additional 5%. This type of position is known generally as a binary dispersion option, specifically a 'worst-of' binary option (we have covered the basics of binary options in a previous post). The following table walks through some examples of this calculation, assuming each stock's initial value is $100. At maturity, the issuing bank will return principal and the final interest payment. The FDIC views each of the interest payments as "incalculable" prior to their crediting and as a result investors are exposed to the credit risk of the issuing bank before these coupons are paid. The value of the structured CD also depends on the correlation of the underlying assets.1 If the underlying assets are generally negatively correlated, then if one of the assets increases above its initial price, one of the other two assets will likely decrease in price. As a result, we generally expect the product to be more valuable as the average pairwise correlation increases. We have valued the product for various levels of average pairwise correlation and have produced the following figure. In addition to the dependence on volatility and correlation, the structured CD's value also depends on the skewness of the underlying return distributions. If any of the underlying stocks have a return distribution that is very negatively skewed (higher probability of negative returns than positive returns), the deposit will decrease in value relative to the case where each of the stocks has a normal return distribution. We have determined that there is about a 30% chance that an investor would receive any additional payments from the market exposure throughout the term of the deposit (ignoring skewness). We find that the structured CDs with this market exposure are at best comparable in value to contemporaneously issued fixed-rate CDs. It's unlikely that investors will appreciate the complicated dependence this particular structured CD has on the characteristics of the underlying assets. It will be interesting to see if other products with similar structure continue to be issued. 1 The returns of two assets are said to be positively correlated if the two assets generally increase and decrease in price at the same time. On the other hand, the returns of two assets are said to be negatively correlated if when one asset increases/decreases in price, the other asset decreases/increases in price. 2 By relative valuation we mean the value of the CD with the altered parameter(s) divided by the value of the CD with observed market parameters. As a result, the relative valuation for a CD with no alteration of parameters is 1 (100%). Barron's reporter Brendan Conway is reporting on a relatively rare phenomenon occurring in oil markets that is benefiting some passive investors. Futures contracts for oil are generally more expensive as the time to expiration increases -- i.e. a contract expiring later is usually more expensive. The story goes that there are costs associated with storing oil and as a result the futures prices reflect the impact of these storage costs. The current situation in the oil markets is the reverse: futures contracts are actually cheaper than the spot price. In this case, demand for immediate delivery of physical oil is offsetting the cost of storage making the spot price for oil exceed the price of short-term futures contracts. Why should investors care? Well, the way investors gain exposure to the oil markets (beyond at the gas pump) is through investing in futures-based ETFs. These ETFs gain exposure to commodities by investing in futures contracts. When the contracts approach expiration, the ETF sells their current holdings and buys futures contracts again. If later dated futures contracts cost more than shorter dated contracts, then investors are selling cheaper contracts for more expensive contracts. We explain this effect (negative roll-yield) in detail within a few of our research papers (PDFs). The current situation is a little different. Since futures prices are actually lower than the spot price, some ETFs are reaping the benefit of selling more expensive contracts and buying less expensive contracts when rolling over their holdings. Although investors with holdings in futures-based oil ETFs (e.g. USO) are benefiting from this rare situation, they shouldn't expect it to last. As demand for immediate delivery decreases, the markets will likely return to the more common state where later dated futures contracts are more expensive. In this state, futures-based ETF investors will once again be exposed to the detrimental effects of negative roll-yield. Our colleagues' recent paper on municipal bond markups, which showed that retail investors were charged nearly $11 billion in markups from 2005-2013, has generated a lot of attention. In June we spent an entire week covering the background, methodology, findings, and implications of that paper, which we think has important implications for the municipal bond investors. Current rules require dealers to trade with customers at “fair and reasonable” prices and to assess market value of municipal securities, according to MSRB. The new rule would address how firms handle bond orders, requiring dealers to evaluate the market, the size and speed of the transaction, the opportunity to get a better price, and the likelihood that the trade will go through, according to regulators. Kathryn also notes that the proposal stems from a joint Government Accountability Office report (PDF) issued in July 2012, which called on Congress to improve the transparency in the municipal bond market. The rule may also derive from a proposal last week from the Securities Industry and Financial Markets Association (SIFMA). The proposal may evolve into a "best-execution" rule similar to FINRA's Rule 5310 ("Best Execution and Interpositioning"). According to the MSRB, the proposed rule is not meant to dilute existing execution requirements but are meant "to impose requirements that are properly tailored for the municipal market". The "fair-pricing" rule does not, however, propose a hard and fast rule regarding markups. It will be interesting to see if the new rule is adopted, and if it is, it is specific enough to prevent the kind of excessive markups we have been highlighting for the past few months. About a month ago, we spent a full week highlighting research (PDF) conducted at our firm that shows the degree to which investors are harmed by excessive markups in municipal bond trading. In the paper, our colleagues argue that low-cost improvements in disclosure requirements could largely eliminate these transfers of wealth from taxpayers and investors to the brokerage industry. After the research was completed, we began thinking about other ways investors gain exposure to municipal bonds. For example, investors can buy shares of a fund whose assets are municipal bonds. As a result, we began looking into municipal bond funds to determine the typical markup charged on their trades. To begin our analysis, we looked at one of the largest municipal bond exchange traded fund (ETF): SPDR® Nuveen Barclays Short Term Municipal Bond ETF (SHM). We obtained the daily holdings for the first half of 2013 via Bloomberg and determined dates on which the holdings of the fund changed (implying a trade). Using these lists of bonds held by the fund, we obtained the trading activity for each municipal bond from the Electronic Municipal Market Access (EMMA) website. At this point, we attempted to reconcile the trading activity implied by the fund holdings with the trading activity given by EMMA. For example, if the fund increased the position in a given bond, the EMMA data should reflect a "Customer bought" order for the same amount around the same time. Let's look at one example that is consistent with our intuition. On February 14, 2013, SHM increased its holdings of a municipal bond with a CUSIP of 208418NN9 by $695,000 according to Bloomberg. EMMA has the following data for the bond around this date. There is a transaction on February 12 in the same amount that is denoted as a "Customer bought", consistent with the interpretation that the fund bought the bonds on or about this date. Now let's look at another time that SHM increased its position. On March 22, 2013, SHM increased its holdings of 403755L74 by $1,325,000. EMMA has the following data for the bond around this date. 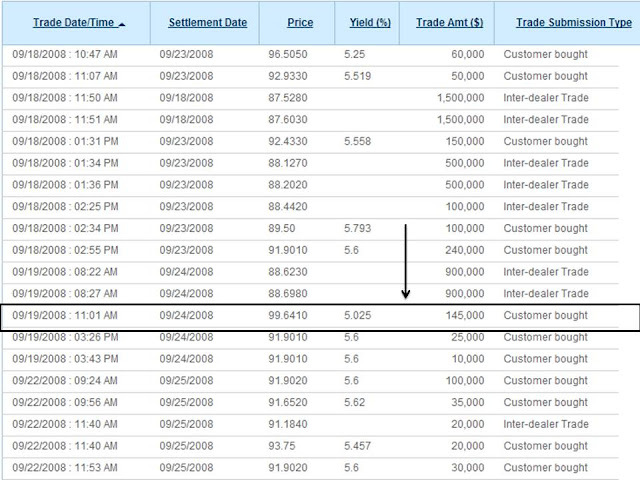 The only trade occuring around this date with the correct trade amount is a "Customer sold" order on March 20, 2013. Given the previous example, it's not clear how this is consistent. Finally, on March 12, 2013, SHM increased its holdings of 613340V39 by $5,000,000. The following image is all of the trading activity EMMA has for the bond. You can see that there is no "Customer bought" or "Customer sold" trades to match with this change in position -- in fact, there are no trades at all within several months of the transaction date! This same phenomenon also exists for fund sales: sometimes it is reflected with a "Customer sale" in the EMMA data, sometimes it is reflected in a "Customer bought," and sometimes it is not reflected at all. We have also attempted to piece together a trade that would match the fund transaction from several smaller trades in the EMMA data around the same time, with limited success. It thus appears that the EMMA data and the fund position data from Bloomberg are sometimes inconsistent. Earlier this week, the Municipal Securities Rulemaking Board (MSRB) announced that "it is seeking additional public input on transforming the public display of real-time trade prices on its Electronic Municipal Market Access (EMMA)". One question that our analysis raises is how complete the EMMA data really is, and if it fully reflects ETF transactions. This information is important for retail investors, who may want to know whether they are charged larger or smaller markups than those charged to institutional investors. UPDATE (12:15PM): The last bond we referenced (CUSIP: 613340V39) changed from the SPDR Nuveen Barclays Municipal Bond ETF (TFI) to the SPDR Nuveen Barclays Short Term Municipal Bond ETF (SHM), both held in the SPDR Trust. The 2007 5% Montgomory County, MD General Obligation bond can be found in TFI's portfolio in the December 31, 2012 report (PDF) and in SHM's portfolio in the March 31, 2013 report (PDF). Therefore, the bond may have been transferred from one SPDR portfolio to another. Perhaps this kind of transaction is not reflected in the EMMA data, but we'll keep tracking this issue down. FINRA has a number of useful web-based tools on their website. We mention their BrokerCheck tool quite often, as it allows investors to check on the professional background and disciplinary history of any particular broker or firm registered with the agency. Another very useful tool is their Market Data Center, which provides a wide variety of market data for free. Perhaps the most useful aspect of the Market Data Center is the the TRACE (Trade Reporting and Compliance Engine) database. TRACE tracks the trade history of corporate bonds, both investment grade and high yield, in a similar fashion as the MSRB's EMMA (Electronic Municipal Market Access) system tracks municipal bonds. We've written a whole series of posts about EMMA, which allows investors to assess whether or not they have been charged excessive markups on municipal bond trades. Investors can use a similar method to assess corporate bond trades using TRACE. In the Bond Section, you can type in an issuer or CUSIP to find a variety of data and metrics for any particular bond, including its trade history (see an example trade history here). This free tool offers investors a great deal of information and transparency that would otherwise require a (very expensive) Bloomberg subscription or other proprietary data source. In fact, just this Monday FINRA expanded its TRACE system to include agency pass-through mortgage-backed securities (MBS) and Small Business Administration (SBA) backed securities. They also have plans to expand their database even further, adding securities "backed by credit card receivables, automobile and student loans, and a variety of other credits." These efforts to increase market transparency help retail investors and market analysts understand these relatively complex securities.